The JPBC-8 also pulls from the advances of our JPBC-7 Variable Mass Carrier. This standard version of the aluminum large-frame VMOS carrier includes three steel weights, two of which can be exchanged for heavier tungsten weights. This carrier also includes our Enhanced Gas Ring for perfect gas seal and a low-friction relationship between ring and carrier bore. 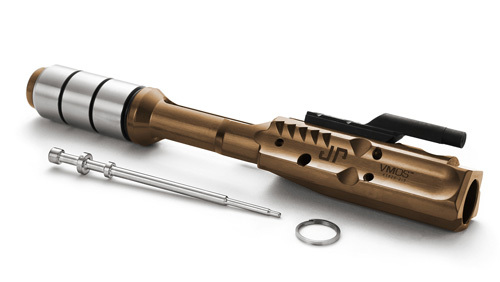 Package includes carrier, titanium firing pin, JP Enhanced Gas Ring and instruction sheet. Non-ferrous specialty carriers should be considered consumable rather than lifetime parts. The JPBC-8 yields a performance advantage for competition applications at a price. Your usage and maintenance will determine the duty life of your carrier. Frequent and generous oiling will extend lifespan. The JPBC-8 is a competition/race gun part only and is not recommended for any duty/defense use where absolute reliability is required. This carrier is also not recommended for SBR or suppressor use. The large-frame VMOS carrier uses the same steel and tungsten weights as GEN 2 Silent Captured Spring units. Only the forward two masses are reconfigurable. The rear-most steel mass cannot be exchanged. This carrier should not be run stripped (i.e., without any masses).